Chord melody solos are perfect for those of us that weren’t born with great singing voices. They let you play the melody at the same time as playing the chords on your ukulele (which sounds more difficult than it is). This book is a great introduction to chord melodies and has 17 arrangements for you to try. The arrangements start fairly simple but get more challenging the more you progress through the book. Ideal for those that are starting to feel like they have the basics down and want to take their playing to the next level. Costs around £11/$15. 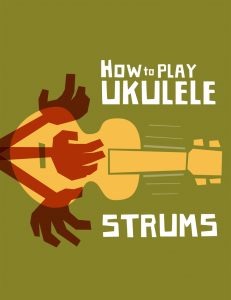 How to Play Ukulele Strums is a pretty descriptive title for a book. Everyone struggles with strumming at some point (even Jake Shimabukuro, well he probably did when he was learning). Al Wood’s ebook is entirely focussed on strumming which makes it a very useful book to own. What I particularly like in How To Play Ukulele Strums is Al’s rather clever way of counting out strumming rhythms which will enable you to learn any strumming pattern no matter how complex (I still use his method now). This book from Ukulele Hunt’s Al Wood is probably the all-round best ukulele book out there (in my humble opinion). It’s absolutely packed full of information and has some great tabs for you to have a go at too. Al does a great job of explaining things and keeps it interesting throughout. If you could buy only one ukulele book, this would be my recommendation. Great for those that are looking for an all-in-one ukulele book with a bit of everything in it. Costs around £15/$18. 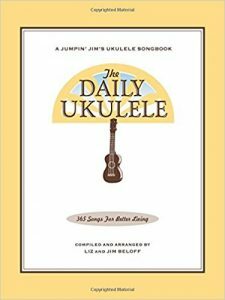 Jim Beloff’s book The Daily Ukulele contains 365 songs for you to learn. Each song has lyrics, chords (including chord boxes) and musical notation for the melody. 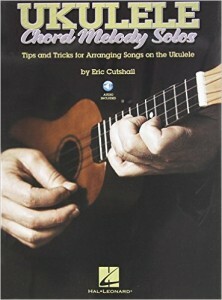 It’s a great book for beginners and is very popular with ukulele clubs. 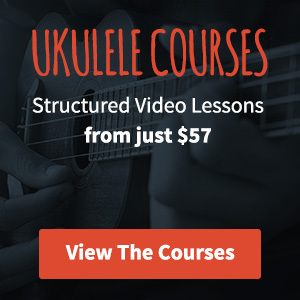 There’s also some tips and shortcuts, chord charts and a ukulele 101 section. Perfect for those that really want to increase their song repertoire. Costs around £20/$25. For those that take their practice time a little more serious. 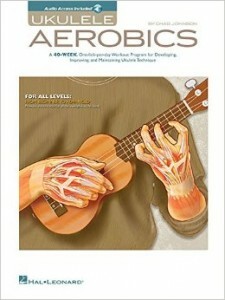 Ukulele Aerobics For All Levels is presented in a weekly format with 40 weeks of daily exercises to get to grips with. It’s not the kind of book that you’re going to sit and read cover to cover but it will give you a very definite method to improving. Starts out simply but soon gets more advanced. For those that area really looking to ramp up their skills. Costs around £12/$14. Quite simply I think this is the best book on clawhammer out there today. Aaron and Nicole Keim (ukulele duo The Quiet American) have put a lot of effort in not only making what is a brilliant resource but they’ve made the book look stunning too. It’s full of traditional old-time American folk music. 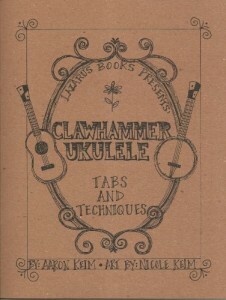 This is the perfect book if you’re looking to get to grips with playing clawhammer, oh and it would make a great gift too. Costs around $20. 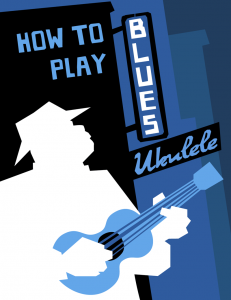 The second book on the list from Al Wood is all about learning to play blues on ukulele. Starts out with basic concepts but is packed with tips and tricks to help you on your way to blues mastery. Everyone should get to grips with playing the blues, it will only help you as a musician. This one is the only ebook on the list and comes with a lot of back up YouTube videos and audio files to help you. If you’re wanting to play the blues on your ukulele this is the book. Costs $17. So that’s my list of what I consider to be the best ukulele books out there. I’ve spent a lot of time with all of these books and they all bring something different to the table. If you have a favourite ukulele book let me know in the comments below, I’m always on the lookout for new things to read and learn from! I like the “ukulele fretboard roadmaps” by Fred Sokolow and Jim Beloff. Teaches you chords anywhere on the fretboard, solo playing, understand chord progressions. 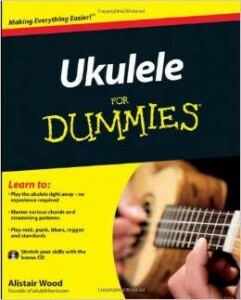 This is not a good first book, but would be great after the ukulele for dummies book. I really like “How to play Fingerstyle solos on the Ukulele” by Mark Kailana Nelson. The arrangements are lovely and he explains the context and technical challenges every piece very clearly. I second the ukulele blues recommendation. Awesome book for blues lovers who try to learn new instrument. Youtube references are definitely a big help during learning process!